It was great to go to Denver to the International New Age Trade Show, where I networked with retailers, wholesalers and manufacturers of uplifting products and services. 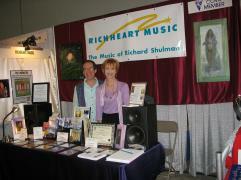 Actually the 11:11 CD tied for first place in the award with Jonathan Goldman's 2012 Ascension Harmonics. It was great to go up on stage with Jonathan and chant the lovely vibrational frequency "WOW" into the microphone together! I get a little embarrassed looking at this photo taken just after receiving the COVR award for the 11:11 CD, but my friends Donna and Kate said I need to show it! Donna Michael, the wonderful singer/songwriter/pianist joined me in the performance for the opening Networking Party. I was helped in the show by my dear friend Kate Levensohn/Ad Sach Kaur (ASK) with whom I partner doing Musical Soul Portraits and visual Soul Portraits / Soul Essence packages. 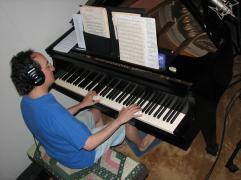 To hear a Musical Soul Portrait done for a group at the United Research Light Center, please click on "Listen." The "A Higher Dimension" CDs have arrived and they are available for purchase at these stores and on our website. 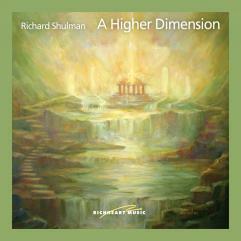 "A Higher Dimension" is Tranquil Solo Piano for Meditation, Healing, and Relaxation. 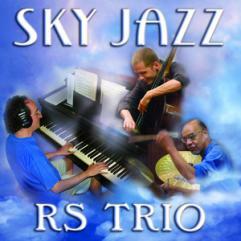 My Jazz trio recorded Sky Jazz last summer and it has now been released. We will be presenting our CD release concert Fri. Aug. 14th at White Horse Black Mountain. See "Tour Dates" below for more info about this concert. Sky jazz is available at these stores and on our website. Click on "Listen" to hear track 1 of Sky Jazz, "Pictures in the Clouds." Concert featuring a preview of the "Dream of Camelot Musical"
Looking for more team members!!!! I've been working wih a small team for many years to bring my music out into the world. This has included my assistant, Lauren Gdovin who now lives in Maine and calls stores and sends demos to market the music. It has also included many friends who have helped me find performance opportunities and network me. (THANK YOU EVERYONE!!!) I have also occasionally hired outside promotional experts who have helped me reach a broader audience. And there is a huge network of businesses and people without whom this business would not be as successful as it is. Now with two new CD releases, the launch of my Jazz trio, a broadway musical almost finished and other recording projects in the wings. I'd like to expand the team. There are lots of opportunities to help at various levels, from inviting me to give a concert to helping with office management to help with coordinating our internet activities (including Facebook, MySpace, Jukebox Alive, etc.) to helping with bookings promotion and sales. Here specifically are the qualifications I'm looking for. 6. have experience or would like to gain experience in the music business. If some or all of these thoughts are a match for you and you'd like to be part of my team, please contact me by email or phone at 828-658-9604.